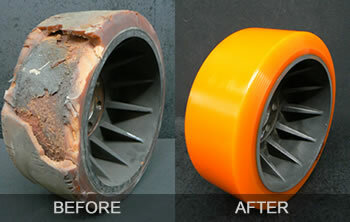 Our polyurethane wheels are non marking and hard wearing, with a superior life expectancy. We supply fully bonded polyurethane wheels for a wide range of applications including forklifts, manlifts, Automatic Guided Vehicles (AGVs) and Automatic Guided Carts (AGCs), floor maintenance equipment, cranes and theme park equipment. If the brand you need is not in this list, please call us as we may well have it in stock. Where we cannot supply off the shelf, we can custom manufacture to your design and specification. Ask one of the Forktyre team for details of our onsite visit – we are happy to come out to your premises to review your (or your customer's) operating environment and any issues you are having, and recommend the most suitable product/s for your application.